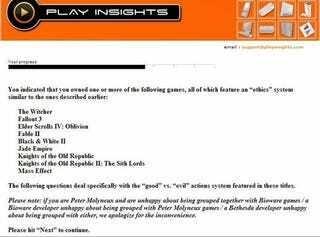 Faithful Kotaku reader Beaver apparently takes marketing surveys over at something called Play Insights, which assures visitors in fine (and grayed) print "Please be assured this is a legitimate research study." Of course it is. Their surveys must be frequented by A-list developers all the time, because here they felt the need to offer a preemptive apology for any unintended butthurt caused by their legitimate research study question on ethics systems in RPGs.